I'm very close with my Dad. Like, extremely close. I think most little girl's admire their fathers, but in a "Daddy's girl" sort of way. That wasn't the way I was raised. I was more like the little boy Dad never had. We spent hours upon hours together in the backyard dribbling through cone after cone, at the high school track running lap after lap, and at the basketball court shooting free throw after free throw. He drove me all over the east coast for every game, every practice and every college visit. He missed less games (and I've had thousands) than I could count on my hand. My dad taught me how to deal with assholes (sorry for the profanity), how to push when you hurt the most and how to grin and bear it when times were tough. 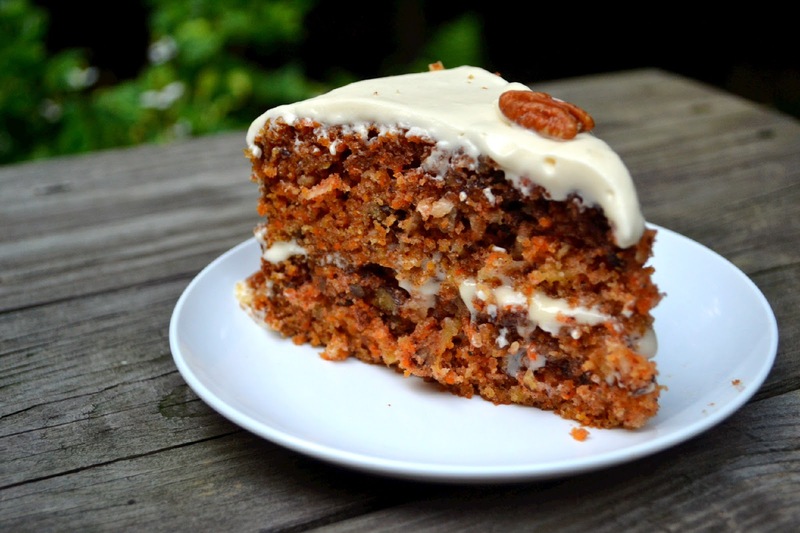 He deserves so so much more than this carrot cake but hey, most dads do. 1. Line 2 (9-inch) round cake pans with wax paper; lightly grease and flour wax paper. Set pans aside. 2. Stir together flour, baking soda, salt and cinnamon in a bowl. In a separate bowl, beat eggs and next 4 ingredients at medium speed with an electric mixer until smooth. Add flour mixture, beating at low speed until blended. 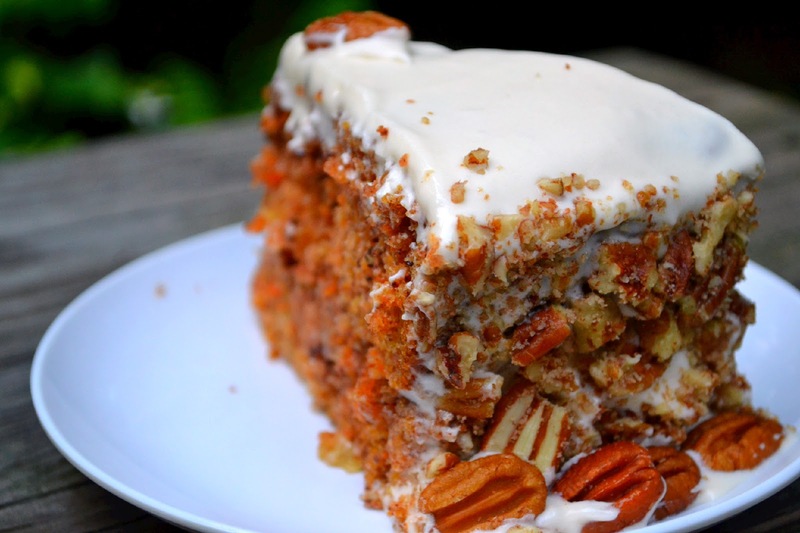 Fold in carrot, pineapple, coconut and pecans. Pour batter into prepared cake pans. 3. Bake at 350° for about 30 minutes or until a wooden pick inserted in center comes out clean. Cool in pans on wire racks 15 minutes. Remove from pans, and cool completely on wire racks. Spread Sweet Milk Cream Cheese Frosting between layers and on top and sides of cake. 4. 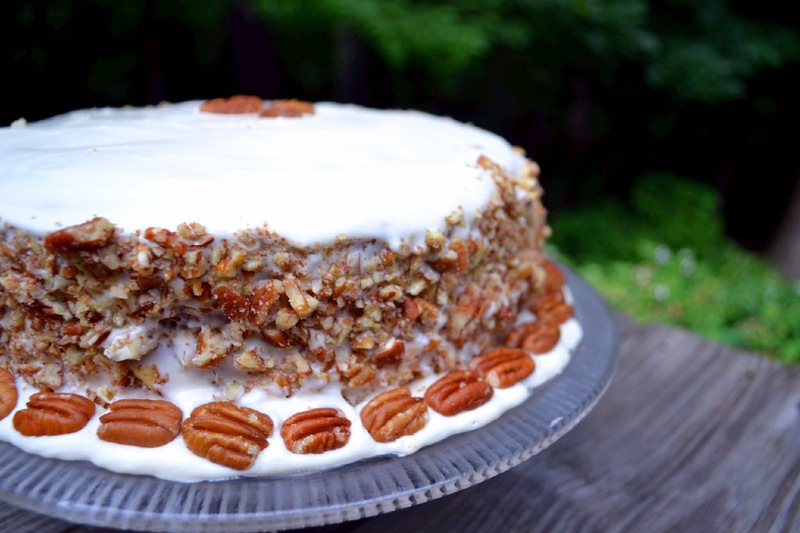 To put chopped nuts on the side of the cake, take a handful into your palm and press it into the side of the cake. 1. Whip cream cheese until fluffy. Add butter and brown sugar and mix until smooth. Add powdered sugar and beat at high speed for three minutes. 2. Add milk and salt. Beat thoroughly for 2-3 minutes. Frost or pipe onto cupcakes. Nice tribute to your dad. This cake looks really moist and yummy-I am sure he enjoyed it. Thanks for sharing. P.S. You're both #1 daughters!!! I was always called my dad's shadow, so I can identify with you! Love the Carrot Cake and the Cream Cheese frosting looks dreamy!